The Nestle Novasource Renal Nutritional Support Vanilla 8oz BrikPak Each, Model #35110000, is anchored in advanced science and research. Nestle Healthcare Nutrition offers nutritional solutions for people with specific dietary needs related to illness, disease states or the special challenges of different life stages. 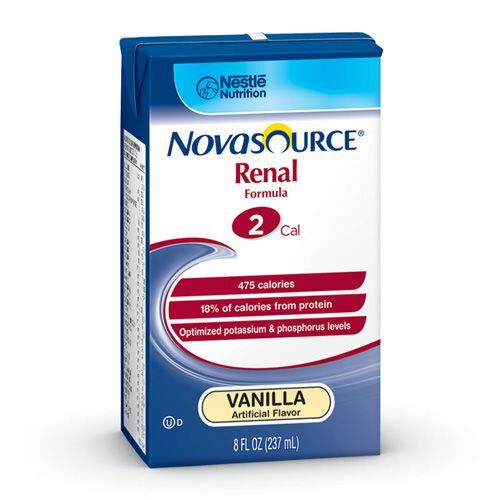 The Nestle Novasource Renal Nutritional Support Vanilla 8oz BrikPak Each is a calorically-dense, complete nutritional formula specifically formulated that provides protein, vitamins and minerals specifically to meet the needs of people with chronic kidney disease (CKD) on dialysis, acute kidney injury (AKI), fluid restrictions due to CKD or AKI, or electrolyte restrictions. Increased protein helps maintain lean muscle. Formulated to meet specific recommendations in the A.S.P.E.N. Clinical guidelines: Nutrition support in Acute and Chronic Renal Failure. Provides 18% of calories from protein (90.7 g/L). Calorically dense for patients who require a fluid restriction. Standardized sodium, potassium and chloride between brik pak and closed system container. Optimized electrolyte content (potassium, magnesium, phosphorus) to help manage imbalances. Closed system with SpikeRight PLUS, the first commercially available proximal enteral connecting system uniquely designed to be incompatible with IV Systems. Chronic Kidney Disease on Dialysis (CKD). Electrolyte restrictions or fluid restriction due to AKI or CKD. Ingredients: Water, Corn Syrup, Canola Oil, Sodium and Calcium Caseinate (from Milk), Isolated Soy Protein, Sugar, Contains 1% or less Soy Lecithin, Potassium Citrate, Calcium Carbonate, Choline Chloride, Maltodextrin, Natural and Artificial Flavor, Salt, Cellulose Gel, L-Carnitine, Magnesium Oxide, Ascorbic Acid, Potassium Chloride, Taurine, Alpha-Tocopheryl Acetate, Cellulose Gum, Zinc Sulfate, Ferrous Sulfate, Niacinamide, Calcium Pantothenate, Copper Gluconate, Pyridoxine Hydrochloride, Manganese Sulfate, Vitamin A Palmitate, Riboflavin, Vitamin D3, Thiamine Hydrochloride, Folic Acid, Beta-Carotene, Chromium Chloride, Potassium Iodide, Sodium Selenite, Sodium Molybdate, Biotin, Phytonadione, Vitamin B12.